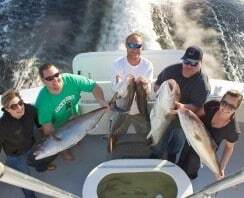 The Boat | Destin FL Fishing Charters - No Alibi Charter Boat Red Snapper, Shark, Cobia, Grouper & More! 'Make It Hap'n Cap'n' Schofield & Crew thank you for giving us the opportunity to provide memories that last a lifetime. Captain Chris Schofield and 1st Mate Brian Friend have been hard at work helping clients land copious amounts of Cobia, Snapper, Trigger, Grouper, Mahi, Amberjack, Mackerel and more! 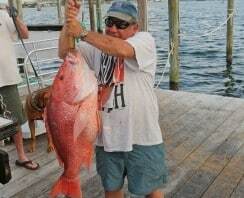 Destin FL Fishing Charters - No Alibi Charter Boat Red Snapper, Shark, Cobia, Grouper & More! We take safety seriously and want to make sure you feel safe while out with us. We are in compliance with the USCG regarding all safety equipment on board, as well as keeping several items not required including a life raft and EPERB. 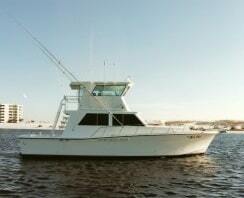 The No Alibi is a 42 foot fiberglass deep sea fishing charter boat located in the Heart of the Destin Harbor and operated by Captain Chris Schofield. The crew and owner pride themselves in keeping the boat in top condition and clean from bow to stern. Fully air-conditioned, and comfortable with many of the amenities from home. We strive to make sure that every passenger gets more than enough personal attention and assistance for an enjoyable saltwater fishing experience for the whole family including the kids. The No Alibi crew knows how to get you right on top of Red and Mingo Snapper, Grouper, Mahi-Mahi, Mackerel, Trigger Fish, Cobia, Shark, and more. No Alibi stands out among the Destin, Florida Offshore Fishing Charter Boat industry by virtue of the lasting memories we help create for you, your friends, and the whole family. Over the years we've been able to share in many adventures. Check out our photo gallery to get a taste of just how awesome the catches are for our guests!